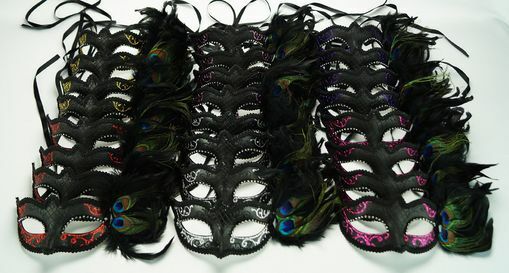 Masquerade feather mas party pack comes with 24 assorted hand painted and glittered masks. Great for large masquerade, black tie, or bachlorette parties. Mask is made of a light weight plastic and more durable than paper mache masks. Comes with black ribbon ties for easy wear. Colors in assortment red, pink, purple, silver, gold and hot pink.